Bagworm on Cedar tree. Photo by Mary Jane Frogge, Extension Associate. Bagworms have become an increasing problem in Lancaster County, Nebraska and surrounding areas. Last year, Lancaster County Horticulture Extension staff and Lancaster County Master Gardeners received hundreds of calls on bagworms. They can severely defoliate and kill evergreens, such as spruce and junipers. Bagworms may also feed on shade and ornamental trees, fruit trees, ornamental shrubs and perennial flowers. Since deciduous plants grow new leaves each year, the defoliation caused by the feeding usually does not kill them. Please take the time to inspect your landscape for bagworms. Mature bagworms are small, one to two inch long, brown bags covered with dead plant material and tightly attached to twigs. The overwintering bags contain as many as 300 to 1000 eggs each. Removing the bags before the end of May can help reduce their summer populations. Crush the bags or place them in the trash in a sealed trash bag. If bags containing larvae are discarded on the ground, the larvae may return to host plants after hatching. Once the eggs hatch in early June, large bagworm populations can completely defoliate and kill evergreens during summer. Light infestations slow the growth of evergreens and lower their windbreak value and aesthetic appearance. 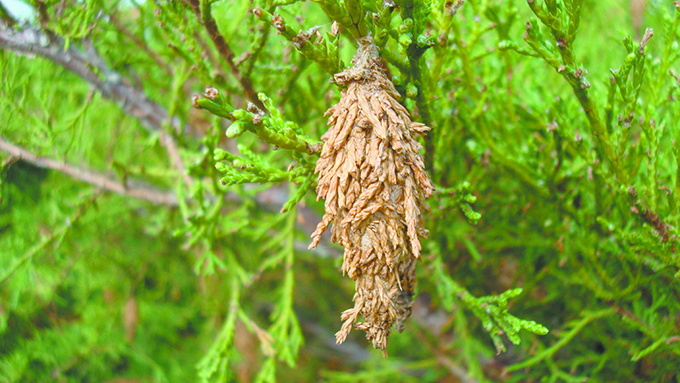 Bagworm eggs hatch in late May and early June. Young bagworms are as small as one-eighth inch long and can be difficult to see. After hatching, the larvae emerge from a hole at the base of the bag and spin down a strand of silk. The tiny insect is often caught by the wind and ballooned to nearby plants. Once a host is found, larvae begin to form a new bag around their body. The larva is a brown or tan caterpillar with black markings. Larvae remain in their protective bag, sticking their head out to feed. Bagworm larvae feed up until late August. The mature larvae then attach their bag to a branch with a strong band of silk and begin to pupate. Adult males emerge in September. They are small, furry gray moths with clear wings. The adult female does not have wings and never leaves the bag. After mating, the male moth dies. The female dies in the bag, mummified around the egg mass that overwinters until the following June. Insecticide control needs to be aimed at young larvae in mid to late June to be effective. Spraying trees is expensive. To get the best control for windbreaks or large stands of trees, late June to early July is the best time to apply insecticides for bagworm control. Feeding by mature caterpillars slows in August before pupation into adults, so chemical control in late summer and fall is not effective. Bacillus thuringiensis is available at nurseries and garden centers as Dipel or Thuricide. Other insecticides currently labeled for bagworm control include acephate, carbaryl, cyfluthrin, malathion and permethrin. Affected plants must be thoroughly covered with the insecticide in June so the insects ingest it as they are feeding. Be sure to read and follow all label directions.